Say Tony Evers has strong record of supporting workers’ rights, energy independence, infrastructure investment and apprenticeship training. 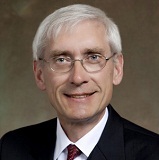 MILWAUKEE – Citing his commitment to Wisconsin’s working families and strengthening its energy infrastructure, the Wisconsin State Conference of International Brotherhood of Electrical Workers (IBEW) announced today that it has endorsed Tony Evers for governor of Wisconsin. The IBEW will be mobilizing its 15,000 members across the state of Wisconsin to support Evers’ campaign. “Our members are on the front lines of Wisconsin’s rapidly evolving utility industry and know what is required to move Wisconsin towards its renewable energy future. With so much at stake, we are confident Tony Evers has the experience and vision to move Wisconsin forward and look forward to working with him to do so,” said Tony Bartels, Secretary Treasurer of the Wisconsin State Conference of International Brotherhood of Electrical Workers. The Wisconsin State Conference of IBEW represents a membership 15,000 strong, consisting of electricians, telecommunications, broadcasting, and linemen and other employees of public utilities.